If you are on the hunt for canning companies that specialize in canning ready-to-drink (RTD) beverages, you are in luck. Tropical Bottling Co. is a full-service beverage canning company that works with countless RTD tea, flavored water, flavored coffee, energy drink, sparkling juice and soft drink manufacturers, and we have the equipment and industry experience to produce top-quality products on every production run. 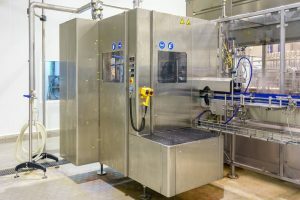 Choosing a canner or beverage copacker can seem like a daunting task, but if you look for a partner with a few key benefits, you can quickly and easily produce your RTD product and get it ready for store shelves. The company you choose should hold one or more industry certifications to further guarantee product quality assurance and control. Tropical Bottling Co. is pleased to be certified by HACCP and the Florida Department of Agriculture. We are also proud to have recently obtained our SQF Level II Certification. SQF certification offers an additional layer of protection, because it is reserved only for those canning companies that show both safety and quality control. You’ll certainly need to find a company that offers the exact processes you need to produce your product. From cold fill and pasteurization to reverse osmosis water treatment and more, Tropical Bottling Co. has all of the tools, equipment and industry experience to produce top-quality beverages for beverage makers across the country. It’s wise to search for canning companies that offer value-added services beyond strictly canning, such as labeling, custom palletizing, exporting and more. At Tropical Bottling Co., we can offer labeling services, as well as custom palletizing options, and we offer storage, export services and much more. In addition, we are excited to offer trial programs for those companies that would like test their new products prior to investing in large production runs. Tropical Bottling Co. proud to serve both seasoned beverage makers and start-ups alike, and we have worked with numerous energy drink, tea, sparkling juice, flavored coffee and soft drink manufacturers in Florida, Georgia, Texas, Oklahoma, Arkansas and throughout the US. Contact us today if you are looking for canning companies to help you get your product on store shelves!